Fri., March 3, 2017, 12:42 a.m.
There’s a lot to like about this year’s Gonzaga women’s basketball team. The Zags are 23-6 and a coming off a West Coast Conference regular-season title, their 11th in 12 years. But it probably won’t be enough to make the NCAA Tournament, should they fail to win the WCC tournament. 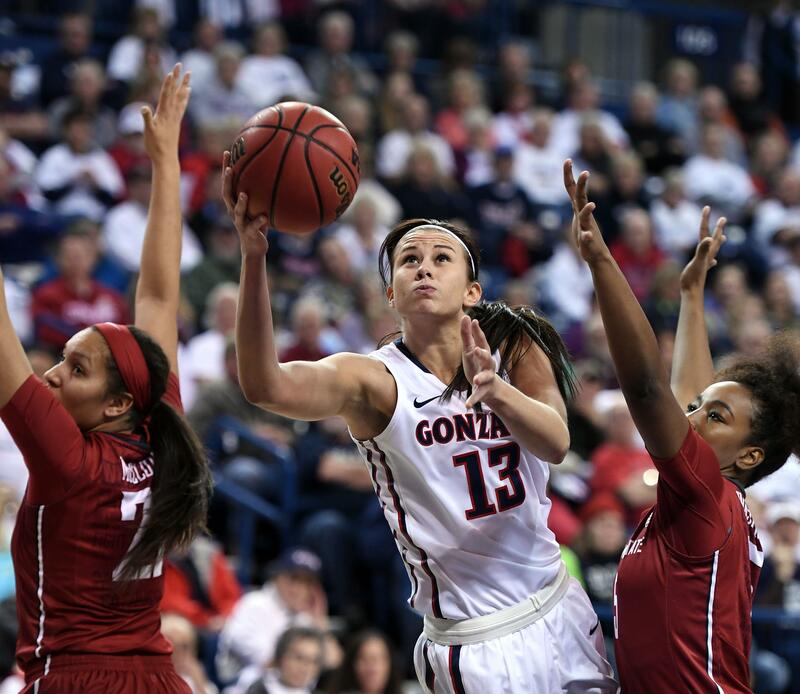 Coach Lisa Fortier admitted as much on Tuesday after the Zags wrapped up practice at the Kennel. In other words, it’s win three games in Vegas or settle for the Women’s NIT for the second year in a row. That may seem unfair, considering that GU also owns a win over No. 8 Stanford and is 43rd in the Sagarin ratings. But as of Thursday, GU is only 78th in the Rating Percentage Index, the main tool used by the NCAA selection committee to select at-large teams for the NCAAs. The biggest problem for GU is the company it keeps. The WCC ranked 10th last year out of 32 conferences, but plummeted to 15th this year. “Some of our teams underperformed this year,” said Fortier, who said she was surprised at some of the nonconference results. “We thought some of the teams in our conference were better than their opponents, but for some reason they didn’t end up on top in those games,” Fortier said. “It’s a bummer, because it does make us into a one-bid league,” Fortier said. Typically, the WCC rates high enough to get two bids, but this isn’t a typical year. BYU is the only other WCC team to crack the top 100 in RPI (the Cougars are 85th). After that, it’s Saint Mary’s at 128 and San Francisco at 141. At the bottom sits Pepperdine, which did a world of damage to Gonzaga’s RPI by knocking off GU in the conference opener in Malibu, California, on Dec. 29. The Waves’ RPI is 308th out of 349 teams in Division I. Two days later, GU lost to Pacific, currently 252nd in RPI. “We dug ourselves a bit of a hole that first weekend,” Fortier said. In retrospect, some of GU’s nonconference opponents underperformed as well. Northwestern was ranked earlier in the season but has lost five of its last seven. Wins over Washington State and Colgate also don’t look as impressive as they did in December, while Nicholls State, UC Irvine and Winthrop turned out to have awful seasons. The bottom line is that GU’s schedule strength ranks just 194th out of 349. “But you have to beat the teams in your conference that you’re supposed to beat,” Fortier said. Now the Zags probably need to do that three straight times, beginning Friday. “We want to be in charge of our own destiny and win three basketball games,” Fortier said. Published: March 3, 2017, 12:42 a.m.